We sure had fun this Halloween Season! Vance gave me the Halloween Bug and we've had a great time this whole month. He was excited to put his costume on and loved trick-or-treating. It took him a couple of houses to warm up, but he turned pro in no time. When we got back home his first choice of candy was a sucker. Next Skittles. Then half of a mini-Butterfinger. (Justin and I stole the two Reese's Peanut Butter Cups from his basket earlier. I'm a firm believer that good candy shouldn't be wasted on 2 year olds!) Soon afterwards his Fast Feet kicked in and he did some dancing. I tried to get some clips, but my memory stick was full. 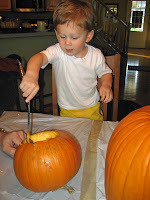 The first picture is of Vance not wanting to touch the pumpkin guts. 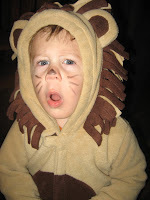 The third is his Roar! face.